Tisnart Tiles takes you beyond the ordinary match 3 games!... 120 levels of entertaining twists and surprises along the way. Which way is gravity pulling on the tiles up/down/left/right? No two boards are the same. Unique power-ups like Tile Blasters, Gravity Tiles, Tile flips, Gas Pods, what's next? 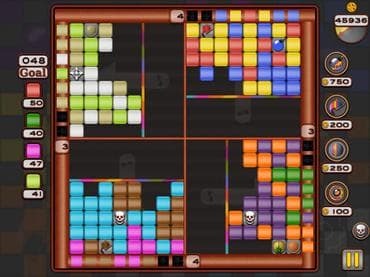 Lookout for Mr.Skull, He is waiting for you to make a mistake so he can steal your tiles. Between split boards, rotating tiles and earthquakes you are bound to get dizzy. Think you got what it takes? If you have questions about Tisnart Tiles game, please contact us using this form.